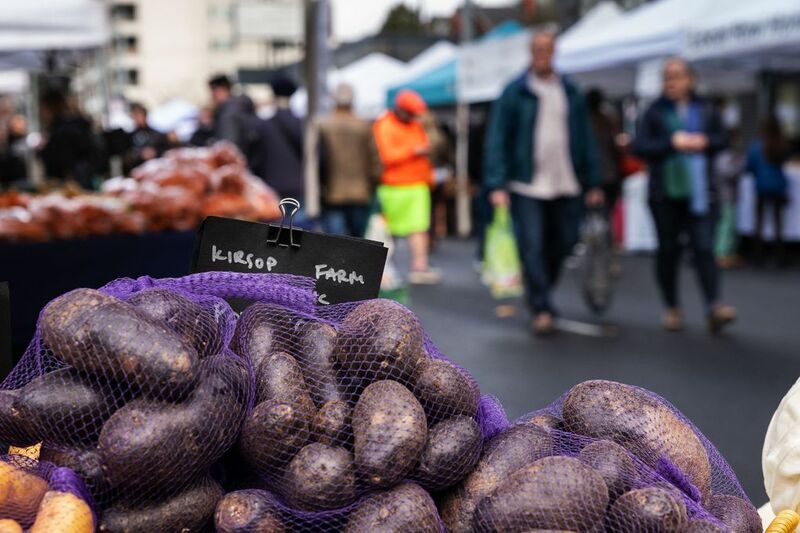 Most people flock to farmers markets in the summer, but, especially in Seattle, where we have several year-round farmers markets, wintertime outdoor shopping and dining allows you to do some things you can't do in the summer. Any time Janelle Stokesberry has friends in Seattle, she tells them to go to the Ballard Farmers Market. “I tell vendors, ‘if you would just speak Italian or French, I would feel like I’m in Europe.’ It’s so gorgeous,” says Stokesberry, the owner of Stokesberry Farms, purveyors of organic whole chickens and eggs, and a regular vendor at the University District and Ballard farmers markets. Of course, this is in the summer, when the scent of ripe berries and melons fills the air, and sunflowers peek from booths. On the day I sit down with Stokesberry at the University District Farmers Market, she’s clad in a stocking cap and a down jacket. It’s early February, and even though there’s still a jovial man with a kazoo and a banjo playing “Jambalaya” — a line of people queuing for hot coffee nearby bob their heads to the music appreciatively — it just isn’t the same as a sunny, summer market. But that doesn’t mean it’s any less picturesque. 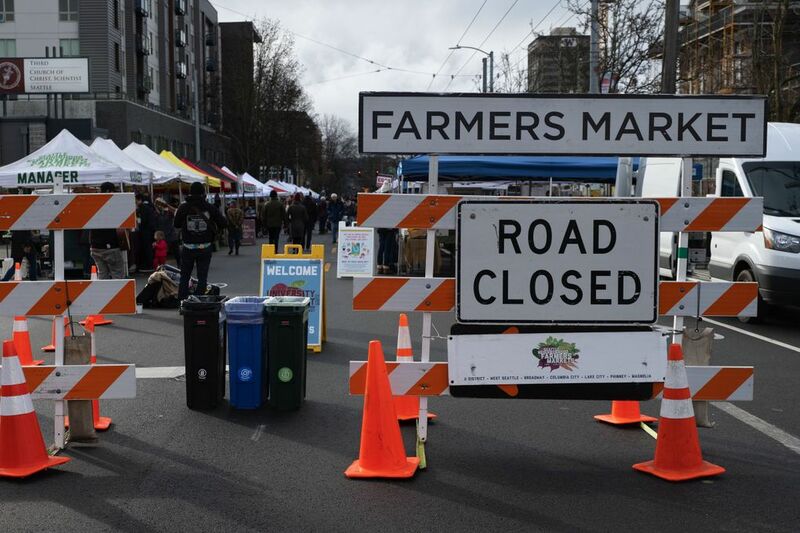 The University District Farmers Market is one of several year-round farmers markets in Seattle, and it’s just as fun to stroll through in the winter as it is in the summer months. Even though bundling up to shop at an outdoor farmers market in February might seem counterintuitive, the vendors at these markets certainty appreciate all the winter foot traffic they can get. So, as Fox notes, if we don’t support our farmers markets in the winter, we might not have them when summer rolls around. If that’s not convincing enough, here are a few more reasons to visit your local farmers market in the offseasons of winter and early spring. Seattle is unique in that there are four year-round farmers markets to choose from. 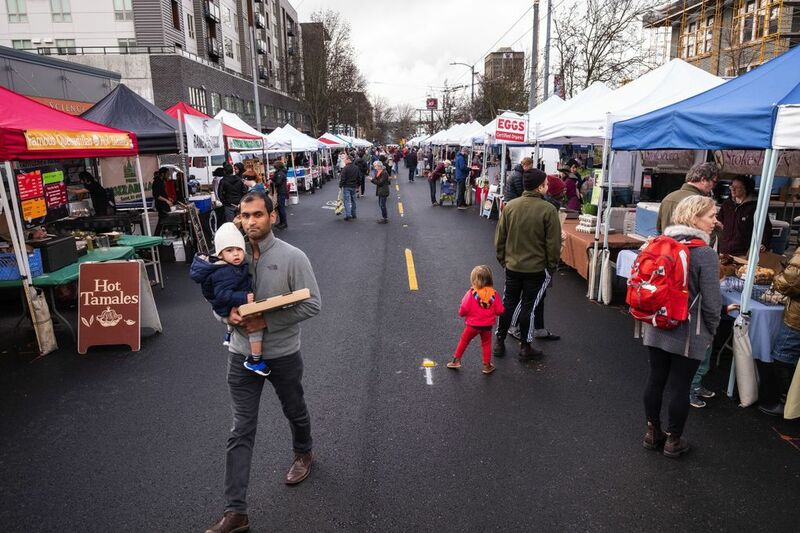 On Saturdays you can visit the University District market, while on Sundays you can take your pick among markets in Capitol Hill, West Seattle and Ballard. And while it’s easy to visit the market closest to your own neighborhood, Fox urges people to branch out. “We do not have cookie-cutter markets. It’s always different,” Fox says. Looking for crumbly goat feta? Hit up Burton Hill Farm at the West Seattle Market. Want to try your hand at making Indian breakfast staples like fluffy idly or crispy, paper-thin dosas? Don’t miss New Origin Foods and its organic, gluten-free rice flour-based batters at the U District market. Hoping to get some microgreens? Head to Capitol Hill and the Tight 5 Microgreens booth. Yearning for a steaming cup of ramen? 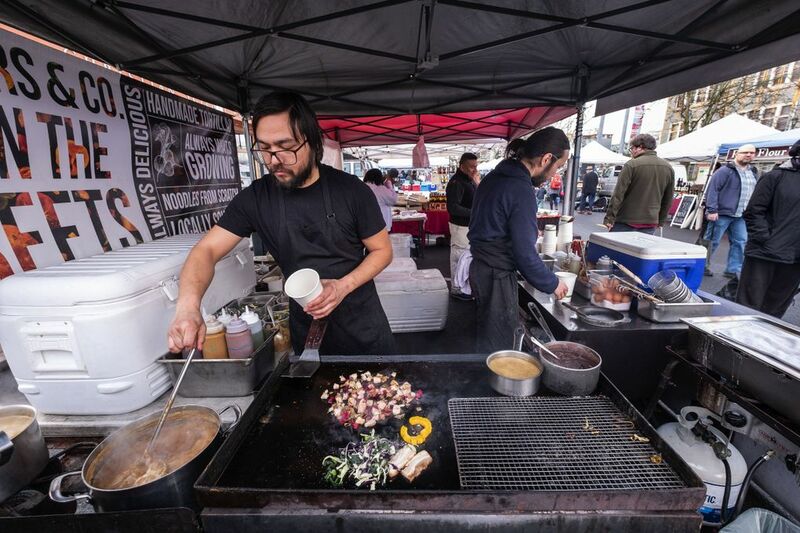 Get in line for handmade noodles at Brothers & Co. at the Ballard Farmers Market. Farmers markets offer a true representation of what is being grown in our region in any particular season. Right now, that means lots of root vegetables, brassicas and hearty kale, pears, apples and mushrooms. Additionally, because these farmers work according to season — and you can meet them each week — the chance for foodborne illness (remember the most recent romaine-related scare?) is lower and it’s more traceable, Fox says. “The difference with these smaller-scale operations is that you can trace things, you can meet someone face to face. It’s a totally different vibe,” says Fox. It also opens the door for smaller production farmers who might not shine as brightly, or have items available during the summer growing season. Like that dosa batter from New Origin Foods, or microgreens from a new vendor at the U District market called Glowing Greens. “In the winter, that’s when people start to pop the most. It’s hard to compete with that bountiful berry display, my eyes are there. I can smell it. Right now, we’re giving people the opportunity to kind of rise out and create that customer base,” says Fox. When summer lines get long, it’s easy to just grab your produce and get out. But the winter and spring markets afford one the time to linger. The vendors are just as interested in getting to you know as you are them. 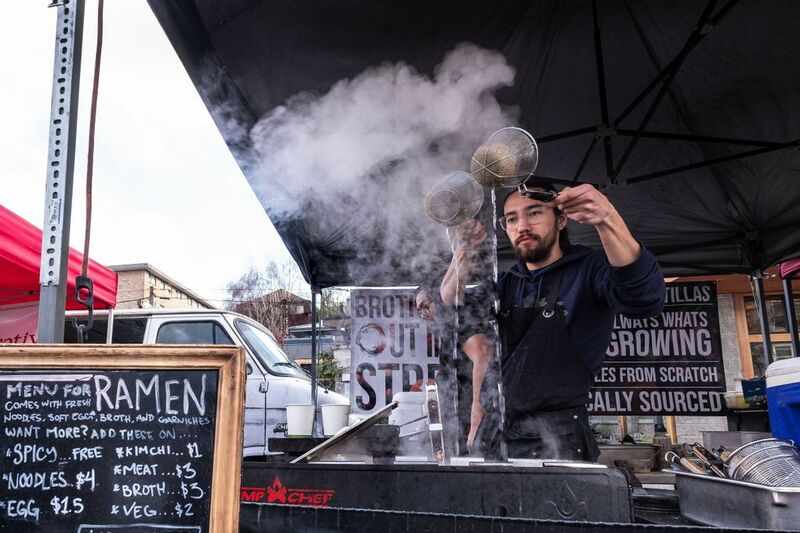 When Zachary and Seth Pacleb of Brothers & Co. first showed up at the University District and Ballard markets last year, they weren’t quite sure what to expect, as many people already have their weekend tradition, stopping at the same food booth each time. But they’ve been pleasantly surprised — now, their mornings at the market are filled with regulars stopping in. “The thing I enjoy the most is just talking to people, getting to know them, hearing the stories, and then come to find out they just keep coming back either from the food or the conversation,” adds Zach Pacleb. Stokesberry says that while summer markets are when she often gets new customers, the winter markets are filled with familiar faces. “The same people (stop by) every week or almost every week and (we get) to catch up with what they’re doing in their lives — so they become friends,” Stokesberry says. Because you have this chance to get up close and personal with a farmer in a market setting, don’t be afraid to ask for sale items or seconds. He might have a secondary bin of apples that aren’t as visually appealing as the apples lined up front and center, but that could be perfect for sauce or canning. Also, don’t be afraid to ask about longevity. Want to eat one pear today and the other at the end of the week? Ask the farmer to help pick based on ripeness. He wants to give you the best he can — just as much as you want to get it.